This flavour has quickly become THEE favourite amongst the Seven Sundays team (and anyone else who has been lucky enough to try it). The initial reaction is typically 'and this is good for me?' News flash - it IS. The cocoa powder is unsweetened, and when it hits the milk and coats the dates magic happens. 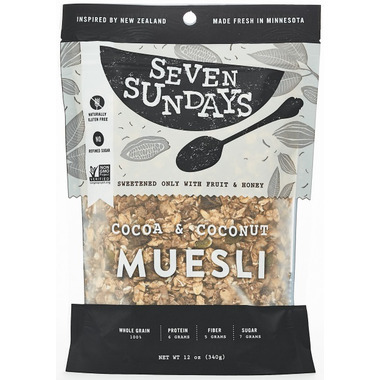 The toasted coconut, sliced almonds and pepitas give it good crunch and protein. They recommend eating straight out of the bag with dairy milk at ANY time of day. Make sure to add enough milk so that you get that last gulp of chocolatey goodness (reminiscent of your cocoa pebble days)!